Cleanse - GreensPlease. Whole Food Green Smoothies. Our lifestyles can lead to a build up of toxins and less optimal performance of our organs and their related systems. The goal with a cleanse is to give eliminating organs a chance to balance and reboot. Consuming cooked oils, protein, caffeine, alcohol and starches can delay or degrade the benefits of a cleanse, therefore, we discourage consuming these types of foods a few days during any cleanse program. We blend, not juice our cleanse smoothies. Blending keeps it a whole food - which means the fiber stays intact. Fiber is the indigestible part of plant foods. It acts as a binding vehicle to move toxins out of your body; reducing or eliminating detox symptoms. In this way, blending is more natural than juicing. The fiber which naturally occurs in greens and fruit is an extremely important part of the whole food. 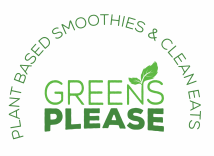 All our smoothies in the Reboot cleanse include six types of dark leafy greens in every sip. The greens we use are organic, fresh, and sourced from local San Diego Farms. For best results follow the number sequence. In the morning start with #1 and end with #7 in the evening. Remember to drink plenty of water to stay hydrated and flush toxins. If you need to snack, we recommend raw vegetables.